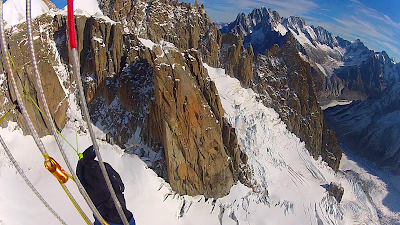 Looking down at the Mer de Glace and the south side of the Chamonix Aiguilles. Flying from the summit of Mont Blanc is something I've wanted to do since I got in to the sport. Although the feat has been done many times and is not technically difficult, it does require a bit of luck and good timing. Mont Blanc is closed for flying from July 1 - Sept 1 every year. The reason for this is because the local rescue group, the PGHM, does not want to have paragliders getting caught up in their helicopter during one of the numerous rescues that are performed during the summer months. So for an itinerant guide, this leaves a few days in June and September to accomplish the flight. After work, unsuitable conditions and sloth are accounted for, this leaves very few opportunities to fly from the summit of Mont Blanc. On Friday, Sept 25, I found myself with an unexpected day off from work. 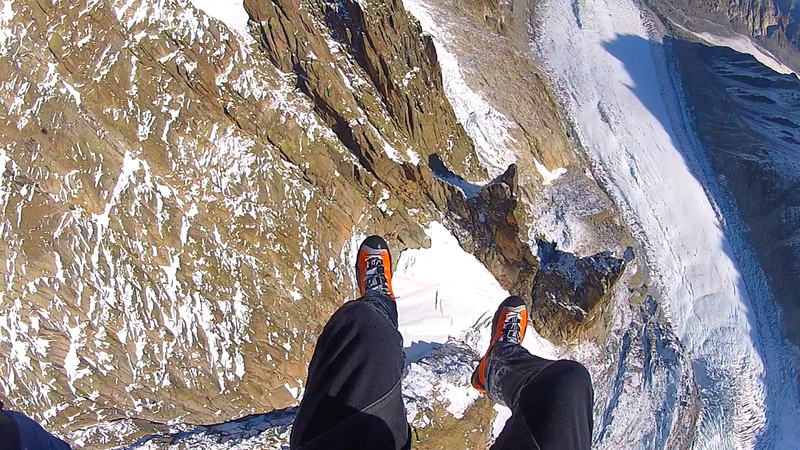 The forecast was perfect for flying so I decided to head up the Aiguille de Midi for a flight. 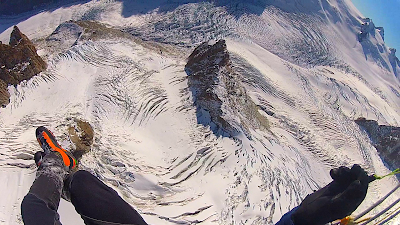 I hadn't flown the Valle Blanche for a few years and I was keen to make the flight. I set up for a south take-off and decided to go for the very shallow launch with a super light tailwind. The consequences of blowing the launch were not serious so I went for it and... after skimming my belly an inch above the ground for a few meters, I eventually nosed into the snow and stopped abruptly. After cleaning the snow out of my eye balls, I waited a while to see what the wind would do. By 10:30 am, there was a light, consistent breeze out of the NE, so I set-up over the North Face of the Midi and launched. My goal was still to fly the south side though, so I hugged the mountain and was able to pass through a low point in the ridge - granting access to the Valle Blanche and the Mer de Glace. When I landed in the valley twenty minutes later, I was so stoked about the beautiful flight that I started thinking about Mont Blanc. My flight back to Canada was scheduled to leave in a day and half so I'd have to get up to a hut that afternoon and fly off the summit early the next morning. The thought of spending my last day in town casually drinking coffee and cragging was tempting, but I figured that there'd be plenty of cragging and coffee in Canada but not a lot of 3800 meter sled rides! So I packed up and took the bus to the telepherique, transferred to the train and made the hour and a half hike up to the Tete Rousse Refuge. The next morning, I left the hut at 5:40 am and four hours and forty minutes later, I was standing on top on an impossibly perfect day for flying. My kit was quite light since I only carried some warm clothes, a light-weight axe, crampons, a light-weight glider (Gin Yeti 19 meter) and a light-weight harness (SUP Air Radicale). After some deliberation, I decided to leave the 1.2 kg reserve behind. In general, I fly with the reserve whenever feasible. However, there are times when I believe that drawbacks of the extra-weight outweigh the added weight. At the end of the day, we all approach risk differently, and while some believe that they can manage risk away, I can't help but feel that luck plays a significant role in every story of success. I took off from the summit around 10:40 am. The wind was light out of the NE and I opted for a forward launch. Although it would have been nice to go with crampons on, I decided to remove them to have more options when landing in the valley. Of course, I managed to screw up the gopro and missed all the footage from the launch and upper mountain. The flight lasted about forty minutes and I landed in a field about three minutes from my apartment. I put the wing away, walked to the bakery, and enjoyed one last pain au chocolat and cafe allonge before heading home to pack for home. A+ Chamonix! I spliced this video together from a south side flight the day before Mont Blanc and from the actual ascent. The Chamonix Aiguilles as seen from the apartment. Waiting for the train to Nid D'Aigle. The Tramway de Mont Blanc. Looking out at the Aravis from the Tete Rousse on Mont Blanc. Evening light at the Tete Rousse. The Gouter Route and Grand Couloir in evening light. If you look close, you can see the Gouter Hut in the center of the upper ridge. The Gouter Refuge at 7:15 am. Looking out at the Aiguille de Midi, Verte, Droites and Courtes. I took this photo from the summit of Mont Blanc the previous year while guiding. Needless to say, I was jealous. Flying the Valle Blanche the day before. I took this same route off Mont Blanc. Looking over at the south side of the Chamonix Aiguilles. My buddy Tim C took this photo one afternoon while playing around at the Brevent launch. This video does a good job of capturing what it's like to fly beneath a few kilograms of nylon.